DEARBORN, United States - Citing the Chapel Hill murders and other attacks against Arabs and Muslims, US presidential candidate Bernie Sanders on Saturday called on Arab Americans to increase their political participation as a defence against discrimination and profiling. Sanders was one of four presidential hopefuls to address attendees of the Arab American Institute’s National Leadership Conference in an attempt to court the Arab vote. In a video message, Vermont Senator Sanders, who is seeking the Democratic nomination, reiterated his position against economic and social inequality. "In America today, we have a system that works really well for a select few, but not for the vast majority of our people," he said. Sanders said that at a time when the Arab-American community is being targeted by the far right, political participation is necessary. "If we want to end institutional racism in this country and close the loopholes on racial profiling by law enforcement, we must join together and demand change," Sanders said. He added that the US must confront the truth of the challenges that minority communities face daily. "We strive for a system of justice for all, but we often fall short," Sanders said. "Shared prosperity and a system that works for everyone requires a revolution of Democratic participation that begins with you, with me and with all Americans." The only Democratic presidential candidate not to address the conference was the frontrunner, former secretary of state Hillary Clinton. The three-day conference, which began on Friday, centred on the Arab-American political platform and key issues for the community, including the Syrian refugee crisis. As the city with largest percentage of Arab Americans in the US, organisers said Dearborn was an important location for the conference. Arab Americans represented about 47 percent of the city’s population of 97,000 in 2013, according to the American Immigration Council. Largely due to its diversity, pundits and national media have identified Michigan as a key swing state in the 2016 election. Arab Americans constitute five percent of Michigan’s voters, according to the Arab American Institute (AAI). AAI James Zogby stressed the significance of the Arab vote for both the community and presidential candidates. "It's important for us that we continue to show that our vote counts, that we take the process seriously," he told Middle East Eye. He added that Arab-American voters could have an impact on the outcome of the 2016 presidential elections in several states. "If Democrats lose Michigan, they lose the election," he said. "We're five-plus percent of the voter turnout in Michigan. In Ohio, Pennsylvania and Florida, because our turnout tends to be higher than the country as a whole, we come out to almost two percent. In a close election, we make the difference. It is really important that politicians take us seriously." Zogby said the more conservative candidates belonging to the Republican party - Jeb Bush, former governor of Florida; Chris Christie, governor of New Jersey; and John Kasich, governor of Ohio - actively sought the Arab vote in past gubernatorial races. Republican presidential candidates Lindsey Graham and Kasich addressed the crowd at the summit via video message on Saturday. Lindsey Graham, a Republican senator from the southern state of South Carolina, focused his speech on combating the Islamic State (IS) group. "As the fight against ISIL continues, the way ahead is tough, but we will get there,” he said, using another acronym for IS. Graham said that after 35 visits to the Middle East he knows that most Muslims reject “radical Islam”. He added that the United States should partner with the people of the region against religious extremism. Omar Kurdi, a communications graduate student at Cleveland State University expressed disappointment in the candidates' video messages. He said Graham’s repeated use of the phrase "radical Islam" offended him. Kasich, meanwhile, said that as governor of Ohio, he makes sure that everybody is represented. “I just wanted to take a moment to really encourage you and congratulate you on the fact that you are engaging here in public opinion and public policy here in America,” he said. Democratic presidential candidate Martin O’Malley attended the conference in person on Friday. After meeting with refugees from Syria and Iraq who attended the conference, O’Malley called on the US to increase aid to the Syrian people and accept 65,000 refugees, as recommended by the International Rescue Committee. "The moral imperative for the United States is clear - we need to step up," he said. "And how we respond would speak volumes to the type of country that we are and the type of world that we strive to give to our kids." O’Malley said the US could lead the world with humanitarian efforts, not just militarily. "There are other ways to lead than at the end of a drone strike," he said. 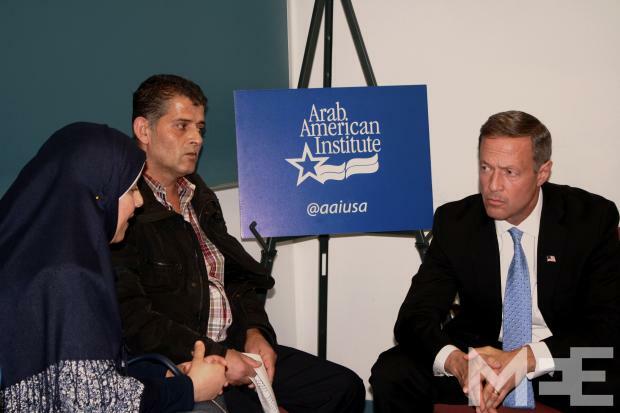 O'Malley was the only candidate to discuss the Israeli-Palestinian conflict at the conference. The former governor called on both sides to return to the negotiating table, saying he is a strong supporter of the two-state solution. He said having two states would meet Israel's security needs and reaffirm the dignity and freedom of Palestinians, and that "it's also in the best security interest of the United States of America and the world." "We can never give up on peace ... especially when it seems hopeless," he said. At least 56 Palestinians and eight Israelis have been killed since protests and clashes erupted over the past three weeks because of what Palestinians say are incursions by Israel on the Al-Aqsa Mosque, Islam's third holiest site. O'Malley expressed his concern for the loss of life on both sides. "All of the victims were sons and daughters; all of them were brothers and sisters; all of them leave behind bleeding families with holes in their hearts," he said. "This senseless violence produces nothing but more tragedy and more violence and more mistrust." In response, AAI president Zogby told MEE what he believes is the difference between how Democrats and Republicans act regarding the Palestinian-Israeli conflict. "Did the problem get solved under Democrats? No, it didn't," he said. But Zogby added that former president George W. Bush did not challenge then-Israeli Prime Minister Ariel Sharon, allowing Israel to act unilaterally and “run rampant" all over the West Bank. "Democrats are weak," he told MEE. "But Republicans are strong, as far as Palestine is concerned. But they're strong in allowing the worst abuses to occur and sometimes even encouraging them."